Before I go to today's recipe, I want to take this chance to thank five of my awesome blogger friends for sharing some blog awards with me which I am truly grateful for. Some of the awards were from last year. My sincerest apologies for acknowledging them just now. I would also like to take this opportunity to share these with some wonderful bloggers who I admire for their effort in putting up a terrific blog. Thanks Kym of Free Spirit Eater for these! 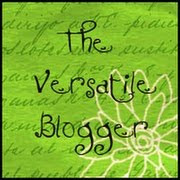 Jo of Chick & Gorgeous Treats for The Versatile Blogger Award!!! Thanks Akheela of TorviewToronto for these! If you are one of the award recipients, feel free to share it with your blog friends who you think are deserving like you! 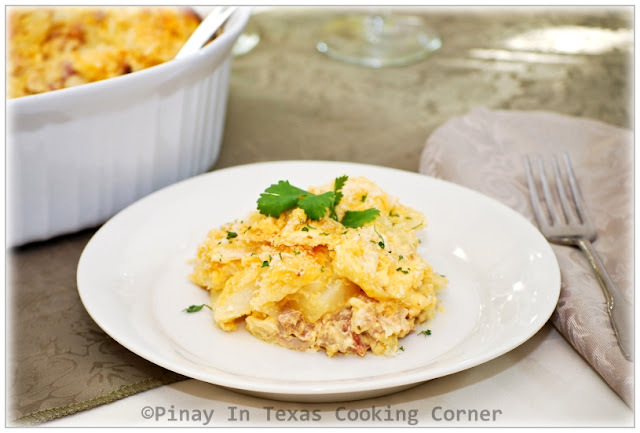 This Ham, Potato, Turkey and Three Cheese Casserole is a delicious all-in-one meal that I came up with to make use of our leftover ham and turkey from the holidays. I combined sweet ham, turkey, potatoes, heavy cream and three kinds of cheese (American, cheddar and Parmesan) to make this as cheesy and creamy as my daughters want it to be, then I topped it with Panko bread crumbs for a crunchy finish. This is just so delicious not to mention so easy to prepare. 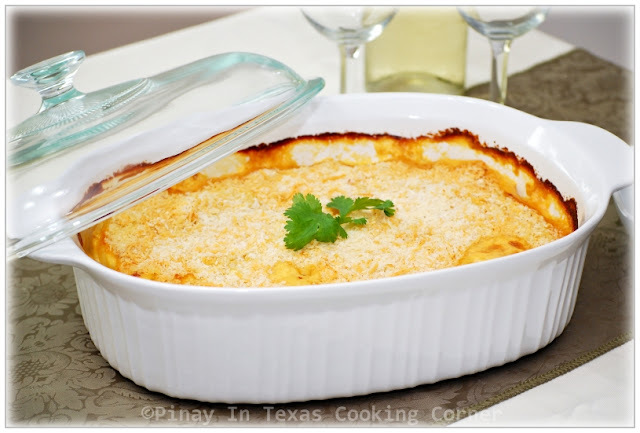 You just have to combine all the ingredients, topped it with cheese sauce which you just have to whisk on the stove for a few minutes, then put it in the oven. 2. 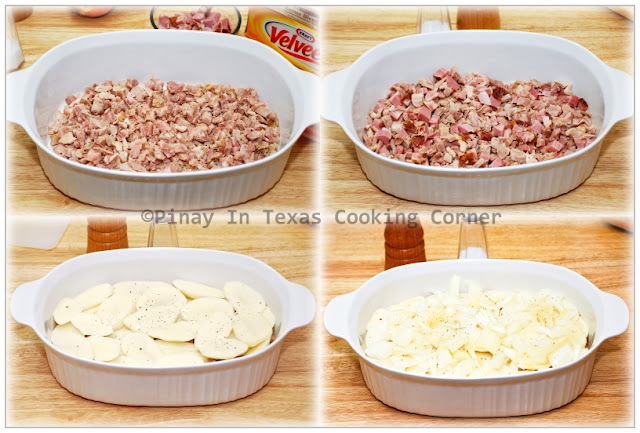 Layer turkey, ham, potato slices and sliced onion in a casserole dish sprayed with non-stick cooking spray, seasoning each layer with salt and pepper. 3. In a saucepan over medium low heat, melt the butter then whisk the Velveeta and cheddar cheese, milk, heavy cream and garlic powder until the cheese is melted and the sauce is smooth. Pour and spread it evenly over the meat, potatoes and onions. 4. Cover the casserole with a glass lid or foil. Bake for 40 minutes, then remove the cover. Sprinkle with panko bread crumbs and Parmesan cheese. Bake for 15 more minutes or until golden brown and the sauce is bubbly. Don't forget to join PiTCC's 1st anniversary giveaway! The giveaway will run until January 22. Oh yay! Thank you so much for the award. I am honored! This dish is packed with comfort. It looks SO good. Oh yeah, but not good for you because of all the dairy! Ooooh cheesy goodness! This is one of those recipes that I know the hubs will LOVE! Tina, you truely are a sweetheart. Thank you so much for these awards. I am so honored you thought of me an my blog. Your page and your photos are truely inspiring and I am just so grateful to have such a great bloggy friend! You're welcome Ridwan! So well deserved! This sounds like delicious comfort food. Congrats for all the awards that you received. You deserve each one of them. And thank you so much for the award. Aww thanks for thinking of me and giving me an award, just what I need to get me through the middle of the week :) I love every layer in this dish so I cant even imagine how good a forkful would taste..
Congratulations on the awards and for your first year anniversary! woot woot you've done a lot in a year... and your awards are here to affirm that. enjoy the rest of the week. and keep on blogging! Oh my it is raining awards over here! Congratulations and all of them are well deserved. 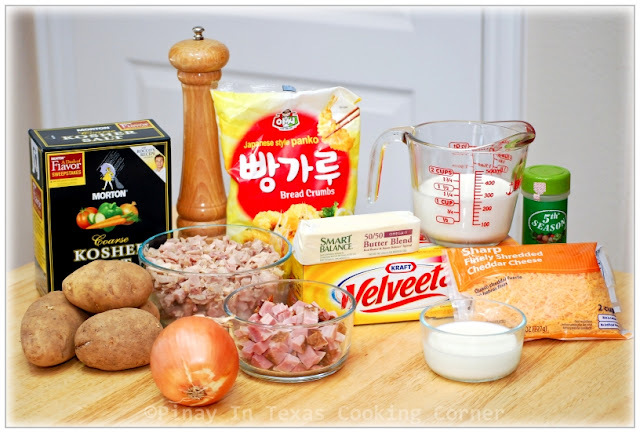 I love one dish meals and your casserole here has some delicious components. Ham potatoes and cheese-that is hard to pass up. Tasty recipe, enjoy the day! Thanks Tina! 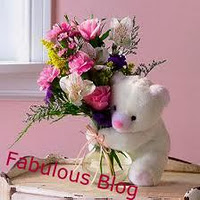 Nice to have met you along my blogging journey! Congratulations on your awards and thank you so much for passing them to mine. I'm honored to receive them from you. :) That's so sweet of you. Your Turkey Casserole looks awesome! This is the best comfort food one could ever get. Thanks for sharing yours. Congrats on the blog awards! This casserole looks delicious! I love anything that uses up ham in more than the old standby ways. Thanks to you too, Kym! Congrats on the blog awards, many of them, Tina!! 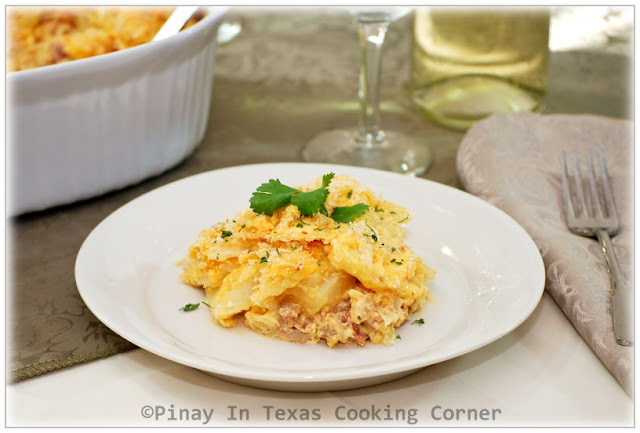 I don't make casserole as much since someone (my husband) is not that into it (BOO!). I'd love to come over and have some at your home. ;-) It's a wonderful way to use leftover and it doesn't look like leftover at all! Your casserole looks leftovers look like a fabulous new dish! A wonderful cheesy recipe! (Lyn loves cheese which is a good thing and a bad thing) LOL! Congratulations for all of these fabulous awards! You are deserving of every single one of them! Thanks SO MUCH for passing FOUR! awards to me! I am truly flattered and grateful! It means a lot to be recognized by my friend bloggers, who I have a high respect for. 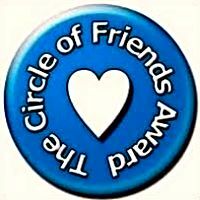 I'm thrilled to be included in your Circle of Friends! Now to the recipe - talk about comfort food! 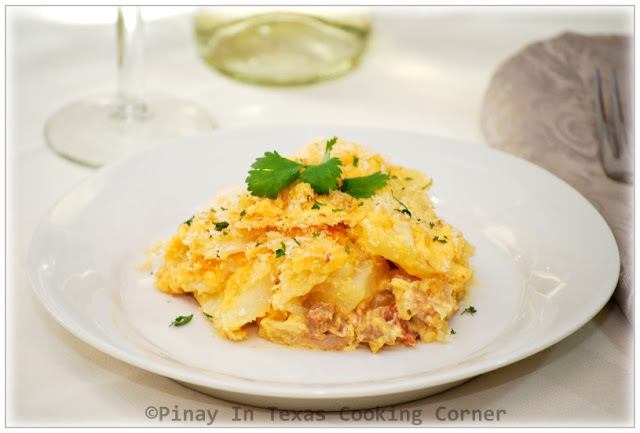 Cheesy, meaty, potato casseroles like this one are SO GOOD! It's amazing what can be done with leftovers! Congrats on the awards Tina. You deliciously deserved it :) and thank you for passing it along to Spanish4Kiddos. It's so awesome to include it on such a wonderful list. Oh wow! 4 awards?! You spoil me, Tina! Thank you, thank you, thank you!!! Congrats on getting 9 for yourself :D That is a huge achievement indeed! Truly well deserved. I love this casserole! Can you believe I had a ham I'd forgotten to serve up on Christmas? That was the joke of the year at the end of that evening. There were just too much food and I guess it was just as well I forgot about it. Now this is a great way to use it up ... not too fussy as well. Thks so much, Tina! Great connecting with u indeed & Happy Blogging! It such a pleasure to know you, Shirley! Congrats on the awards received so far Tina and thank you for forwarding one of it to me but sorry to say I don't such awards and to be honest, it does not interest me. Hope you understand. As for the recipe, I think I will leave out the ham and turkey. I want to try a vegetarian version of it with the rest of the ingredients and oh my! the 3 combination of cheese will be great because your pics says it all. Thanks for sharing. You have a beautiful blog and your food is great, I have tried some of your recipes, me and my family loved. Thanks for sharing wonderful recipes, Good luck and wish you some more awards! Thanks Muna! It's so nice to know that you've tried some of my recipes. Tina , that casserole really looks delish ! Love the photos , too ;) Btw, thank you so much for that award , really appreciate it !!! You're welcome, Anne! You deserve them! That looks like an amazing casserole! I would be all over that! Congrats on all well deserved awards..that's telling us how special and sweet you are! Your dish is perfect, and I love love love it!!! Thanks sweetie for sharing and have a wonderful day!! Thank you so much for passing the award on to me! Congrats on your one year (it's mine this month too!) and all the awards. This looks great! You're welcome, Linds! Advance happy anniversary to your blog! Your casserole looks delicious! This is the kind of dish my boys will really enjoy. Have a lovely weekend! Aw Tina you are so sweet. Thank you so much for this. Congrats on one year of blogging. You are doing so incredible. You should be really proud of yourself. And this recipe is really amazing. I love the photos, so bright and inviting. Thanks Kim! You are so deserving of the award...your blog is so fabulous!